During a recent trip, my husband and I were involved in the most enlightening conversation about eating habits with family and friends of ours. All three of our children happened to be present and listening quite attentively — despite the inviting surroundings and loads of activities ready for the taking! One of the individuals present said that for the past twenty years he’s only eaten fresh fruit and yogurt til lunch. Then a salad midday, followed by a “normal-size” dinner. The practice helped him shed 20-25lbs which he has kept off for those twenty years. The fruit and yogurt allow for much easier and more rapid digestion with the body getting all the nutrients its needs in the purest of forms. He also said it gives him much more energy that lasts longer. Of course, he is also quite active — running a few times per week and more recently taking hot yoga classes weekly which he swears by. He also admits to parking his car in the furthest spot from the store, for those few extra precious steps of exercise. One of my sons has decided to adopt this breakfast-eating practice, after being impressed and convinced by what he had heard. Up till now the practice in our family is “please eat something for breakfast” — that normally takes the form of cereal or fruit or a muffin or eggs or toast, or a smoothie etc. Our concern is more that something substantial is consumed by the kids, rather than what specifically that might be. The morning hours are filled with enough activity without engaging in a battle over what to eat. We tend not to buy overly-sugary cereals or any other high-sugar, high-fat items — so the choices are both pretty healthy and plentiful. The conversation then progressed to weekly dinners, menu-planning, family meals, etc. I shared, our age-old story and tried and true practice, which anyone who knows us has heard at least once. We cook on the weekends, usually Sunday afternoons, for the week. My husband and I, (now with the help of our kids) have got the process down to 2 hours. Some chop, other assemble and presto — five dishes ready to be frozen and retrieved any night of the week. This weekly ritual was one my parents practiced every Sunday — which is how I learned how to cook — and it made so much sense to me. I am not the type of person to begin figuring dinner out at 5 or 6pm. It would never work. As my sister and I got older with all kinds of after-school sports and other activities, we would be able to eat dinner, which was always prepared regardless of what hour we walked through the door, which effectively eliminated the practice of snacking. Cooking once for the week really begins at the grocery store, with what you purchase. Anyhow, this couple, parents of a combined 3, were both fascinated and surprised. They couldn’t believe that in 2 hours you could produce 5-6 meaningful, healthy meals. We swear by it. It has saved us, especially with a zillion activities at different times on the afternoon and weekend schedule. One of the things that the food industry preys on is our convenience-driven society. Give it to me fast and tasty, demands the consumer, and hence you are left with row upon row of fast, filling food, much of it frozen — that is steeped in fat, calories, sodium and very little food value. I’ve said this many times before — it’s been amazing to me to watch the growth and evolution of the frozen food section of any grocery store. It used to be just an aisle, if not less. It’s so much bigger now, with a fair amount of questionable stuff buried in there. Eating healthy is hard work. So is anything worth anything. It takes planning, organization, time, fresh ingredients, interest and desire. 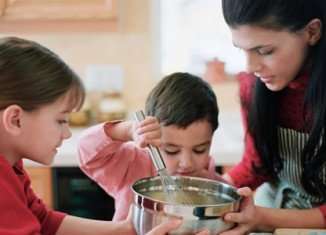 As Oprah once said, the person responsible for cooking the family meal has “the most important job in the house.” So true. It certainly can be slammed together with processed, canned, frozen and other convenient foods. Or it can be part of a bigger, more important ritual that has a lasting impact — not only on each person’s health and well-being but on how they view food, how they eat and enjoy it, and how they share that experience with each other. Hopefully, that results in positive, lasting memories for everyone.